We learned yesterday that suspicious packages sent to the home of the Clinton's and the Obama's were intercepted by law enforcement agencies. We also know that a homemade pipe bomb device was found in the mailbox of billionaire globalist and large Democrat donor George Soros last week. Part of the New York CNN building was closed due to a reported device delivered to their mail room. All this while 14,000 organized "migrants" are now crossing Mexico, planning to illegally cross our southern border. The mystery of the bombs. Here is a rundown of what is happening, and what we know so far. Authorities in New York safely detonated a bomb sent to the home of progressive billionaire activist George Soros on Monday. A suspicious package addressed to the Chappaqua home of Bill and Hillary Clinton was intercepted. The Associated Press says that, contrary to early reports, the package was singled out at a nearby facility, not at the Clintons’ home. The Secret Service intercepted a suspicious package addressed to Barack Obama’s residence in Washington, DC. 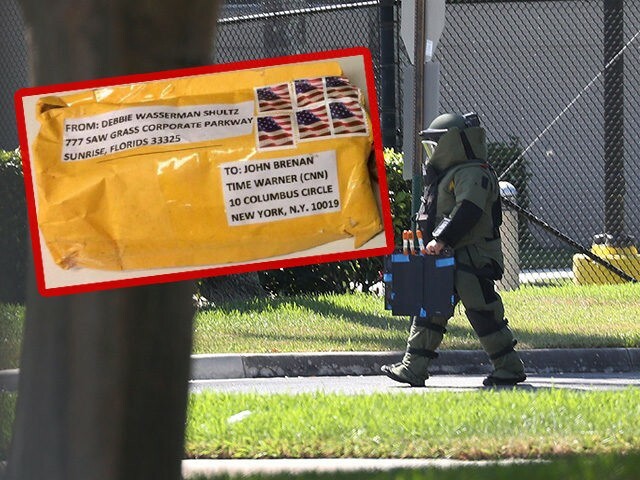 A mail bomb addressed to former CIA Director John Brennan was opened in the offices of CNN at the Time Warner Center in New York City. The building has been evacuated. The return address on the CNN parcel is the Florida office of Rep. Debbie Wasserman Schultz (D-FL). One package has reportedly gone to this address after it was sent to former U.S. Attorney General Eric Holder. Reports suspected similar packages were sent to Sen. Kamala Harris (D-CA) and Gov. Andrew Cuomo (D-NY) but were false alarms. Unconfirmed reports say that a package addressed to Rep. Maxine Waters (D-CA) was intercepted at a Maryland sorting facility. A CNN report claimed that a pipe bomb was intercepted on its way to the White House, but the story turned out to be false. President Trump and Vice President Pence both immediately responded, condemning the acts, calling them despicable. In a joint statement, Democratic Senate and House minority leaders Chuck Schumer and Nancy Pelosi said Trump's words "ring hollow until he reverses his statements that condone acts of violence." Most on the Left are blaming President Trump for the bombs. Theories of who sent the bombs are many. Is the sender Left or Right? Calculated? Or mentally challenged? Is it a set-up to make Republicans look bad and anger the Democrats so they will be sure to vote? I'm personally wondering how the pictures of the bomb sent to John Brennan at the CNN building were posted to social media so quickly? The authorities don't usually do that. And what about the other devices? Generally, when people receive a bomb in the mail, their first reaction is not to post it on social media and send images to the press. Normally people would step away---quickly, and call the authorities. I would. Wouldn't you? I would suspect the authorities will move very quickly in the investigation. Hopefully, we will learn much more today and in the coming days. But the mid-term mystery about the bombs hangs heavily over America this morning. Days before a monumental election. The mystery of the borders. About 14,000 migrants are walking toward our southern border. While it is being cast by the media as a spontaneous event, the facts say otherwise. The timing of the migration is suspect to anyone who takes an honest look at it. Evidence now emerging from people embedded in the migration is showing it is neither spontaneous, nor locally funded. The San Antonio Express-News reports, "Although the caravan's origin story remains somewhat opaque, the answer from many migrants here is that they had wanted to leave for months or years---then a Facebook post or television program, a WhatsApp group---they saw an image of the growing group and decided,"
WND is reporting that "The Department of Homeland Security said Tuesday it can confirm that gang members and males from the Middle East and Asia are in the caravan..."
DHS spokesman Tyler Houlton said, "There are individuals within the caravan who are gang members with criminal records. 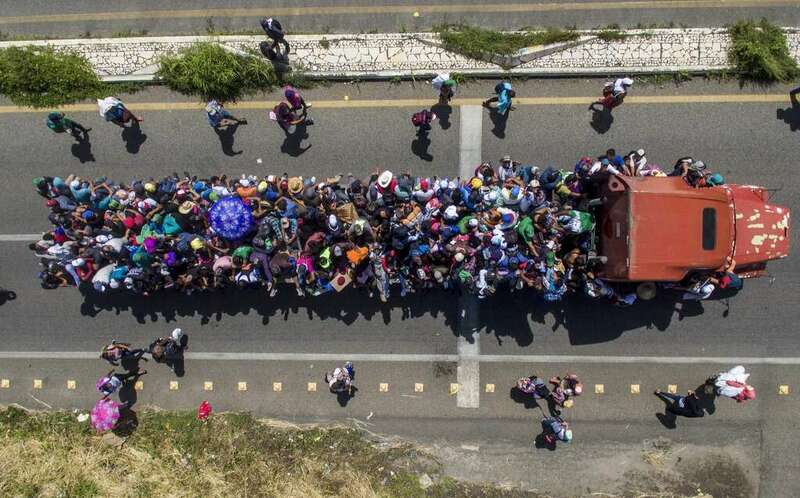 Citizens of countries outside Central America, including countries in the Middle East, Africa, South Asia, and elsewhere are currently traveling through Mexico toward the U.S."
Tom Fitton, president of Judicial Watch which has people in the caravan, confirm what DHS is saying. Sara Carter, an investigative reporter in Guatemala, has found "That's it's mostly men crossing the Guatemala border." She says they give rehearsed comments---particularly, "This is not politics---this is about poverty." Judicial Watch people embedded in the caravan say the media will only interview and feature desperate migrants seeking a better life. While there are those among the migrants, Judicial Watch folks says many are "gang members and mobs of young angry men"---"seeking a better life" is hardly an honest description of the migrants. Judicial Watch says when asked who is sponsoring the caravan, they always insist it is a "spontaneous event," but JW says, "there were clearly organizers shouting instructions in Spanish and putting select persons in front of the cameras for interviews." Conservative Honduran President Juan Orlando Hernandez says that migrants are being manipulated by the Left to destabilize his country, and Vice President Pence told the Washington Post that Hernandez told him Venezuela's left-wing government was financing the caravan. Sarah Carter says Guatemala's defense department told her that the migration was being spearheaded by "leftist organizations north of the border." The Guatemalan Secretary of Intelligence, Mario Duarte, said: "Guatemalans are getting robbed and crimes are being committed by the people in the caravan." Hernandez says women and children are being exploited regularly. Even now buses are being used to move the caravan closer to the US border before our election day. This is a confrontation between those who believe in America as a sovereign nation, and those who are committed globalists. "Be of good courage, and he shall strengthen your heart, all you that hope in the Lord" (Psalm 31:24). Be Informed. Be Courageous. Be Vigilant. Be Prayerful. VOTE. Bill O'Riley says the caravan is the work of George Soros who has done the same elsewhere. We just can't prove it. When lots of mayhem begins to show up at once, I'm thinking it's because something is about to happen. These are diversions, and oppositions to our government. If that picture is of a real package that was mailed, why are the stamps not canceled?